Real progress with the 700 – 27 Feb 2015. Well, things have moved on a pace with the V7 loop. This is going to be a really long post. All the wiring is done! The biggest job was to fit the headlamp relays and flasher relay for the indicators. Before I ran any wiring I needed to make sure everything would fit behind the battery and below the regulator where the existing starter motor relay is. This is a big old jobby. I bought mounting blocks for four relays which slide together to make a block. They will take three, four or five pin relays . I’m going to fit modern fused relays for the starter, main beam and dip as well as the flasher can all in one bank. I found out that my relay blocks wouldn’t fit past the mounting screws and I had to cut off the redundant mounting for a clip so that they would go in. One stroke of luck was that the mounting holes for three relays matched up exactly with the mount for the old starter relay. I figured that I could mount the three fused relays here then hang the flasher can on the right hand side like this. I refitted the battery to check for clearance and found that the clamp for the battery fouled the mount for the flasher can. This meant I had to hang that on the other end of the block. It wasn’t my first choice due to the regulator wiring there. The next thing I did was to make a mount to take some additional warning lights. My bike, being a “police type” has an instrument cluster with bolts at the front. This is where the radio handset would have been fitted. I made a bracket from some scrap aluminium to take a repeater for the main beam and indicators as well as my battery charge indicator from SparkBright. Now all I had to do was to run the wiring. Happily, I’m ok with electrics. I know a lot of people struggle. For the starter relay, I just really substituted a modern relay for the old one although I had to alter the spade connectors for one that fitted in the relay mount. The connections are even numbered the same. The relays I bought have a fuse in the supply to the load side of the relay. I kept this at 30A for the starter. For the headlamp relays, the old main and dip wires from the handlebar switch go to the distribution block in the headlamp. I unplugged these from the distribution block and extended them both with new wire back to my new relays (terminal 86). These are now the switch cables and will trigger the relays. The other side of the trigger part of the relay (85) is earthed. 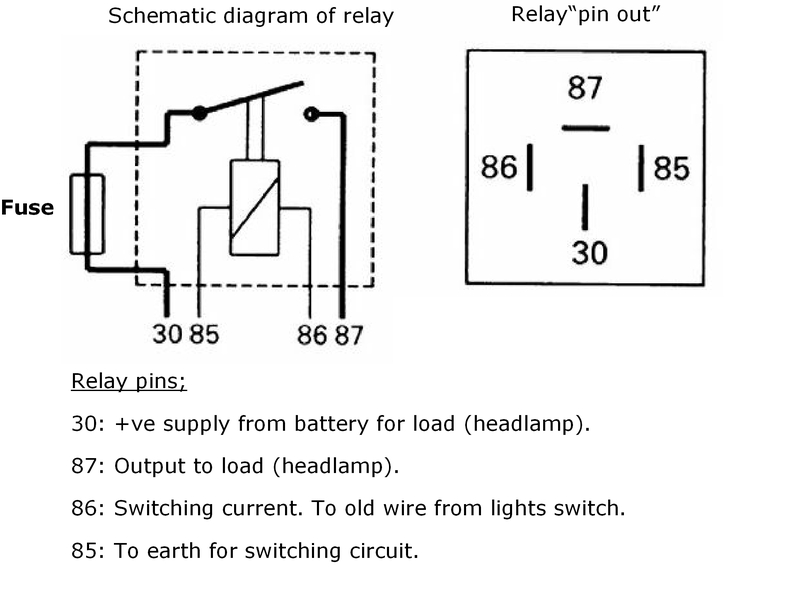 A positive feed was piggy backed off the supply to the starter relay to each of the headlamp relays’ fused supply (30). The remaining load terminal (87) is wired back to the distribution block in the headlamp to the points where the original wires were disconnected. In fact, what I did was run all the cables through sleeving before I crimped on any connectors. Heat shrink tags were put on the headlamp trigger and load wires so I couldn’t get them crossed. I reduced the size of the fuses to 15A for these two relays. Finally, for the headlamps, in the distribution block there is an unused connection socket next to the main beam connector. This is wired to it and is used as the supply for my warning lamp. The other side of the lamp is earthed. The next job was to wire up the turn indicators. I used a three-pin flasher can as this was what I had. The switch was one I have had for years. It was fitted to Rhino the V7Sport back when I bought it in 1978. The brake lever perch had been modified with a slot and tapped hole to take the switch which I think came from an old BMW of some sort. Its chunky, made of metal and nice to use. It meant that I had to dismantle the brake and choke lever to change the perch for the old V7Sport one which was a direct replacement and was a spare anyway. Here’s the switch that was on the V7 when I bought it and the one from Rhino on the right. Modified lever perch on the left. This is fairly straightforward. A supply wire runs from the lower side of a fuse in the fuseholder to the + terminal of the flasher relay. The output from the flasher (L) goes via a connection in the headlamp shell to the flasher switch. The wires for left and right lamps go from the switch to the headlamp where they are split front and back. The wire for the warning lamp was again run to a connector in the headlamp shell. Then from this to the warning lamp in my new “dash” and the other side of the lamp earthed. Once again I ran the cables in sleeving before crimping on the various connectors. As I had to run the indicator wires to the back of the bike, I removed the wires to the brake/tail lamp so that I could fit rubber grommets to the holes in the rear mudguard. As It turned out, the brake wire was chafed through already. Repairs were made then the cables fed back through all the loops inside the mudguard. I had to take the right hand pannier off to get at this. The final wiring job was to fit the battery monitor. This just needs to have a positive supply and a good earth. I connected the +ve to the fused side of the power supply in the headlamp shell controlled by the ignition switch. The monitor is a LED which changes colour and flashes to show the state of the battery with the ignition off and the engine not started. It shows generator output when the engine is running. When I got the V7 700 I couldn’t find a wiring diagram that matched it anywhere. I went through the bike and drew my own and found it was a combination of two. Here’s the diagram I drew EOG604K original wiring. This is my wiring diagram now that all the work has been completed EOG604K wiring final. One interesting point is that the ignition switch has a “start” key position to the right of “on”. I tested this with a meter and it would work. However there is just not a wire in the loom for it so the key just turns and springs back doing nothing. The oil pressure switch again. Last time I described how I had got the oil pressure sender working by removing it and spraying it internally with brake cleaner. Sadly this worked for all of 10 seconds. The oil light was on. I started the engine. The oil light went out. I turned off the engine. The oil light stayed out. This meant I had to get a replacement sender (they’re really cheap anyway) and repeat the rigmarole to fit it. The only difference is that the original had a female connector on the top and the new one is male. Leak from the back of the gearbox. There was a small drip of gear oil from the back of the gearbox where the clutch pushrod is. I know that there is a short cylinder in here which has an O-ring in a groove. Inboard of this is a needle bearing then another stepped cylinder and the pushrod. To get the cylinder out (Guzzi call it the “outer body”), first disconnect the clutch cable from the arm on the back of the gearbox by unscrewing the adjuster. I levered the clutch arm with a bit of wood so that I could get the cable off. To remove the clutch arm you remove the split pin from its pivot. Then push the pivot pin up but not out of its mounting and release the lever. If you push the pivot right out it’s a real pain to get back in! Once off it’s possible to pull the “outer body” from the gearbox housing. Here you can see the clutch arm and its adjuster, The “outer body” with o-ring fitted and the bearing which came out with it. Changing the o-ring is easy. I could see nothing wrong with it but changing the ring has cured the drip. The o-ring is a standard size and you don’t have to get one from Guzzi. The size is 17mm ID × 22mm OD × 2.5mm thick. I think I bought 10 for just over £2. It all went together just as easily as it came apart and, as I say, the leak is gone. When I fitted a pipe to the fuel tap I had to leave off the filter. I had intended to fit an in-line filter but found this was not possible. That length of fuel hose is so short that, when a filter is added it’s not flexible enough to fit. So, I’ve had to give up on that and will rely on the existing filters at the carb inlets. I figure that the fuel from the unfiltered tap is not coming from the bottom of the tank so should be pretty clean. It’s the reserve tap on the other side which needs a filter the most (and still has it) as this drains the tank to the bottom. By filling and draining fuel I think I have ended up with a reserve capacity of about 5 litres which may be a bit much. Originally there was a white rubber (?) gasket ring between the glass of the headlamp unit and inside of the chrome rim. Mine was very perished and replacements don’t seem to be available. I bought a meter of 4mm o-ring chord and cut a length to fit. I glued the ends together with super glue and held it in place in the rim with three small dobs of black silicone to stop it from dropping out. It seems to be perfect for the job. It wasn’t far but I did it. I got out and rode my V7. It’s been almost 6 months since my accident and it was good. My wrist held up ok. I called round to see “Gerwyn the Tyres” and we agreed that I should replace these. They are at least 20 and possibly over 30 years old. Date codes are pre 2000 type and could be for ’91 and ’93 or even ’81 and ’83. The bike left government service in ’86 and has had virtually no use since then so the 80s is really possible. He couldn’t match internet prices so I’ll get ‘em and he’ll fit ‘em as I don’t think my wrist is up to it. All tucked up for the night. More jobs on the V7 loop – 14 Feb 2015. I’m still working on the V7 700 to get ready for the spring and so, work on Rhino is on hold for the time being. Following my accident, and the resulting damage to my wrist, I had been concerned that I might not be able to use a twistgrip. Thankfully this was not the case. However, the original throttle was too “slow” in that it needed to be turned about 120 degrees to open it. There’s no way I can get near that but I did find I could turn the V7Sport’s throttle almost all the way (about 90 degrees). So I bought this Domino throttle shown below the original jobby. I then needed a replacement upper throttle cable as I needed much more free play in the cable. I had the replacement made to drawing by Speedy Cables who did a good job. It all works as it should and is not too heavy. It actually feels like it’s lighter than my V7Sport throttle was. This is probably because the cables are new and nicely oiled. When I bought this bike I noticed the switch didn’t work. This is a really common annoyance on Guzzis. They tend to (but not always) fail in the “off” position so that the charge warning light just stays off when you switch the bike on. Over the years I’ve replaced loads for just this reason. A little while ago I was told that they can be revived by being given a squirt of brake cleaner and a tap on the bench if necessary. I had my doubts but decided to give it a go. First I had to get the thing out. There was no way this could happen with the dynamo cover in place and that came off easily. Then I was faced with this. There’s no space to get a socket on the switch and no room to attack it with a spanner. So I removed the split pin from the end of the bottom dynamo bracket that you can see in the photo in the hope that I could push it through a little and get clearance for a deep socket. Nope, too tight! I had to undo the dynamo top clamp slightly. I counted the number of “flats” as I turned the bolt so that it could go back as it was. Eight “flats” was enough and the pivot could be slid a little way to give clearance and the switch was soon out. I tested the switch on the bench. There was no continuity. It all looked nice and clean but, I gave it a squirt up inside with brake cleaner then tested it again. It appears to have worked – contact! Well I’ll be… I gave it another spray for good measure then let it dry out properly. Update: This was not a success. When I ran the engine all was ok, but the oil light stayed out when I switched off and I had to buy a new sender anyway. Refitting was, as they say in the manuals, the reverse of the dismantling procedure. Pivot knocked back, split pin inserted and top bolt re-tightened the eight “flats”. The dynamo cover still needs to go back on. When bought, the bike had a lamp which would dip to the right, continental style, if it weren’t for the piece of tape stuck on the lens. Here in the UK we drive on the left so the lamp needs to dip to the left. Although riding with the bit of tape on the glass is legal, I wanted to correct this. The existing lamp was also an older type which had been fitted with a halogen conversion bulb and I wanted to update it to a more modern H4 unit. I bought a Cibie unit but couldn’t use it because it was too deep and knocked the fuses out of the fuseblock at the back of the headlamp shell. I tried the Lucas one from the V7Sport and that was the same. I sought advice on the UK Guzzi forums and was told that a Wipac Quadoptic unit would fit. Very helpfully “Dave P” at Guzziriders.org took his headlamp to bits and measured what he had. Based on this I bought a Wipac unit and, sure enough, it fits. This photo shows the various sizes of the lamps measured from the face that contacts the headlamp rim to the tip of the bulb terminals. I’ve made a start on the wiring. 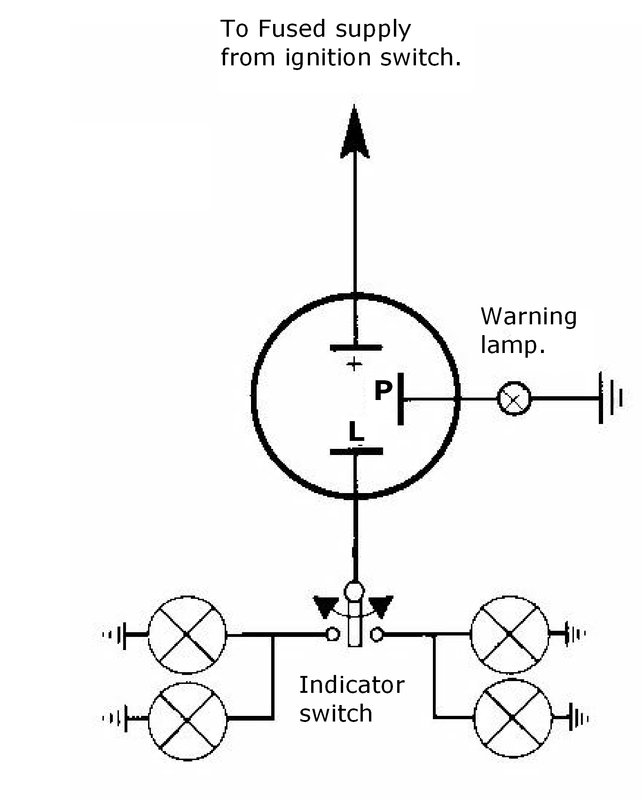 Indicators. Need to be redone from scratch. I’m using an ancient switch that was on Rhino when I got him and fitting a repeater lamp. The bleeper thing will not be reused. Relays will be fitted to main and dip beam circuits to protect the switch contacts and improve light out put. Fit a high beam indicator. Wiring to the stop/tail light needs to be reinstalled as there are no grommets where the cables pass through the mudguard. Fit a battery condition lamp. I’ve bought an indicator from Sparkbright. I need to change the O-ring on the clutch body at the back of the gearbox. I still need to decide if I need to drill a hole in the fuel filler cap to act as a breather. It all seems a bit strange. Fit a filter to the fuel line from the tap I modified to get a reserve fuel capacity. Check over and adjust everything!